It’s been five years since I assisted my first assignment in digital storytelling. I kindly cornered one of our philosophy professors and described the many ways digital storytelling could help his students gain 21st century literacy skills; the ability to use digital, visual, textual, and technological tools in learning. I was motivated by seeing our students, digital natives, as consumers of technology but not creators with technology. In 2010, Kathy Filatreau, our Instructional Technologist and I attended NITLE Camp where we did a poster presentation explaining how technology and pedagogy can come together to create an authentic learning experience. Our poster included pictures of Whittier students engaged in making digital stories; a process of active learning strategies in writing, storyboarding, capturing audio, photos and video and then editing. 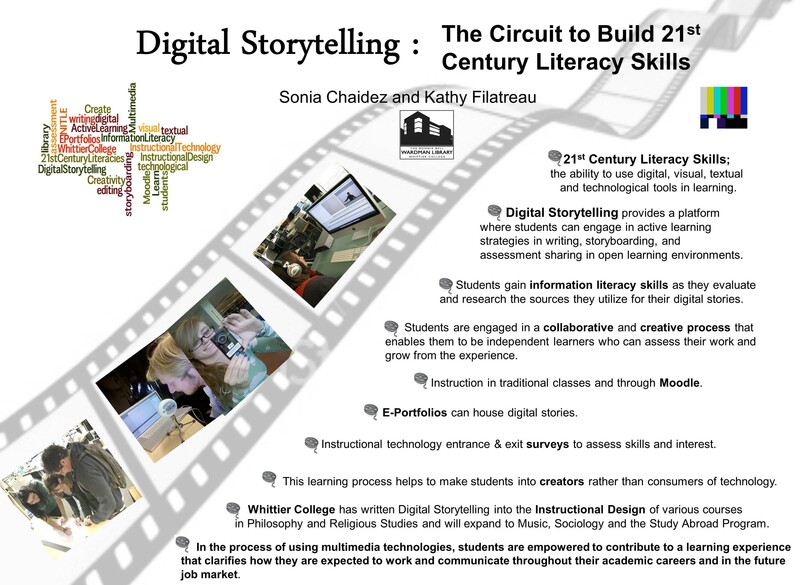 Kathy, faculty collaborators and I have now facilitated nearly 400 student-produced digital stories, assisting faculty across the campus. The process of assisting teaching and learning through digital storytelling has surpassed our initial expectation of just getting students to gain digital literacies and marketable skills. Writing. Script. Storyboard. Multimedia. Editing. Share. Faculty require students to base their narratives on course content and with evidence of research– much like the requirements of a term paper. But, they also want students to write stories with elements found in a narrative arc; introduction of scene/characters, conflict, challenge, climax, and resolution. Finally, they want students to exercise the skill of writing with brevity and economy- to be concise and eliminate unnecessary details. The narratives they ask students to draft for their digital stories are usually a page and a half of double-spaced writing which translates to three minutes of recorded audio. I’ve found that this part of the assignment is arguably the most difficult. Step 1: Writing. The narrative should include a central theme that follows the content learned throughout the course. The narrative can also take on a theme that allows the viewer to relate to the student experience. Step 2: Script. The script is the edited narrative that is recorded. Step 3: The Storyboard. The storyboard allows the student to organize the flow of visuals and script. Step 5: Creating the digital story. Using video editing tools such as FinalCut, iMovie, or WeVideo to put together the digital story. Step 6: Share. On the last day of class, students share their digital stories with their peers and invited guests. The last step in this process, share, appears to me as the breakthrough of how digital storytelling is contributing to or perhaps even changing digital pedagogy. Students would not normally stand up in the front of class and read their entire term papers out loud one by one. If they did, the attention span of the class would suffer much the same if they were reading excerpts from a tax code manual. But with the presentation of the digital stories, each student presents their recorded content in 3 minutes with visuals, graphics, and accompanying music in a way that matches their personal creative style. This presentation process engages students in a way that helps them recall and reflect on the many themes and ideas discussed throughout the course. It’s also an opportunity to jointly share student work to create larger digital projects that can explain a different narrative. As part of a DigLibArts teaching with technology assignment this semester, students studying history of the U.S.-Mexico border are creating digital stories based on interviews they’ve conducted highlighting experiences of migration through different decades of the 20th century. They will then use a map and “pin” their digital stories to the region they describe. The enhanced map will be shared with a larger community of historians and students who can contribute to this larger narrative. Learning through storytelling is nothing new but using the power of storytelling to help faculty reinvent their pedagogy is exciting! Now in its third year, the Future of Storytelling (FoST) summit in New York City brings together game-theorists, digital media strategists, journalists, programmers and even neuroscientists who want to transform the world one story at a time. For me, helping students with this assignment began as a way to put together a presentation with technology tools. Now I see that the process is just as important (perhaps more) as the finished product.